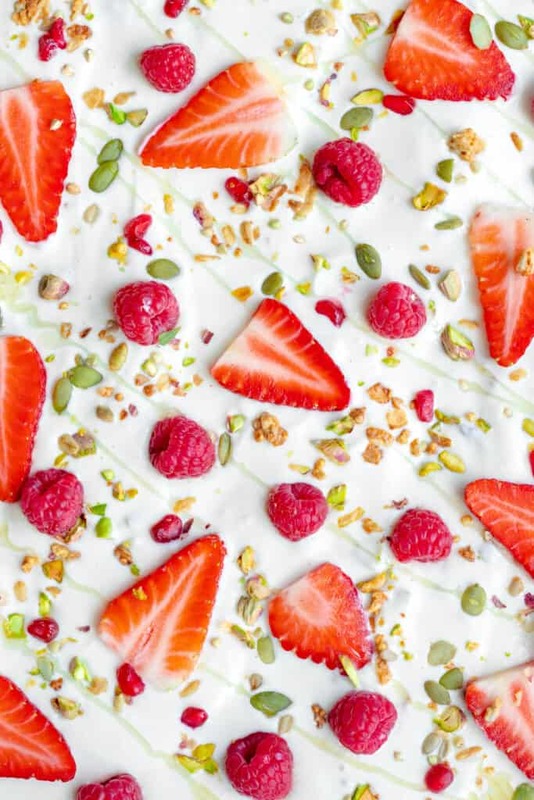 Is this fruity yoghurt bark the most aesthetically pleasing thing you have ever seen? I have a huge lack of snack recipes on GE. Being creative with snacks is hard, especially when trying to keep them nutritious. I’m a snack feind and regularly find myself grazing on nuts, munching on energy balls or with my hand in the granola jar – but I am bored. 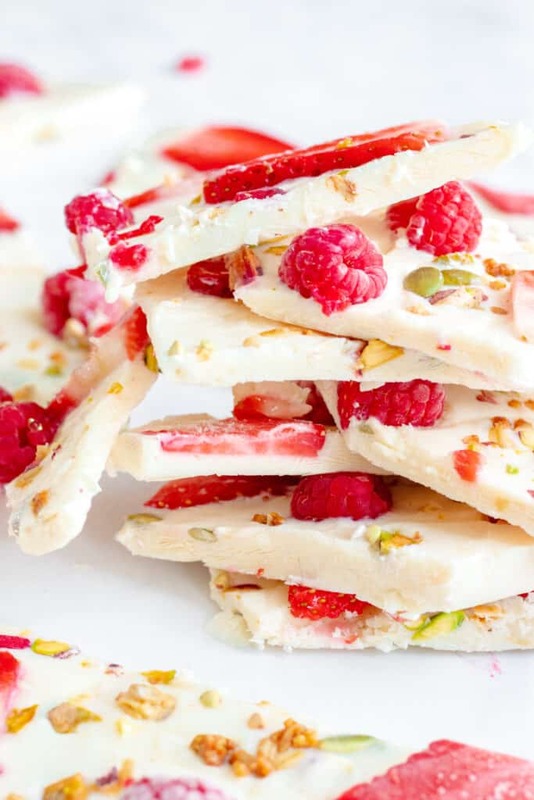 I need something new in my life, something exciting… something… frozen… Oh hello fruity yoghurt bark! Nice to meet you. 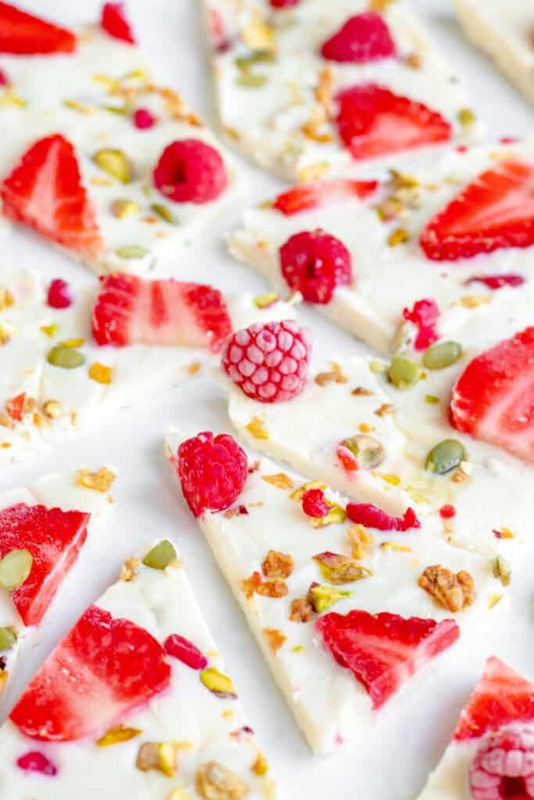 This frozen yoghurt bark is the definition of ‘easy to make’. It takes 5 minutes and the hardest part is waiting for it to freeze. Once broken into shards, it can be kept in the freezer for up to 3 months and will become your new best friend in times of hanger. It’s particularly good as an after dinner treat when you just need a little something sweet. 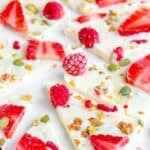 CAN I CUSTOMISE THIS YOGHURT BARK? 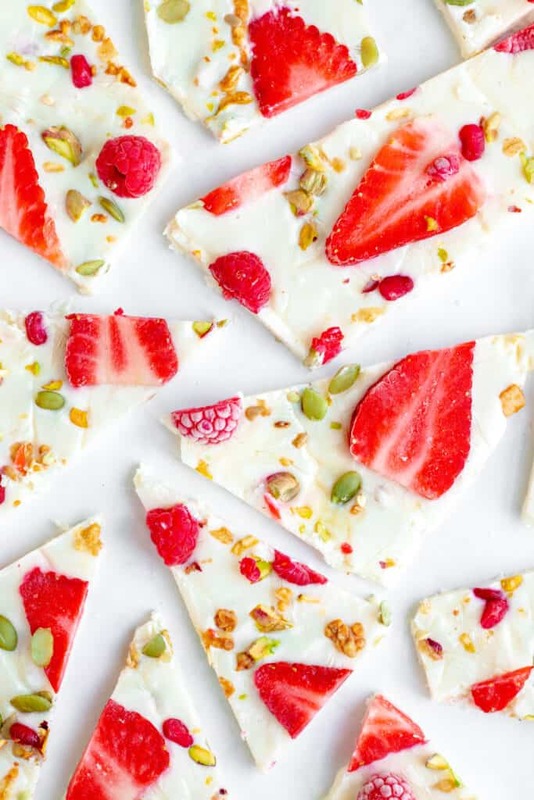 The best thing about this yoghurt bark is that you can completely make it your own. The type/flavour of yoghurt, sweetness and toppings can all be changed to how you like it, or what you have in the kitchen. 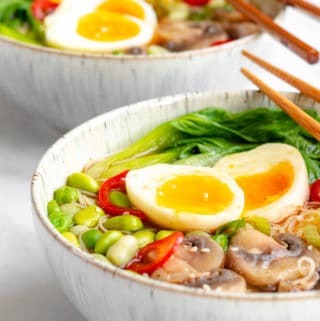 If you fancy something slightly different to the given recipe, why not give these variations a go? Chocolate Bark: Mix 3-4 tbsp of cacao powder into the yoghurt mixture and top with your toppings of choice. Why not try sprinkling with chopped toasted hazelnuts for an ode to Nutella? 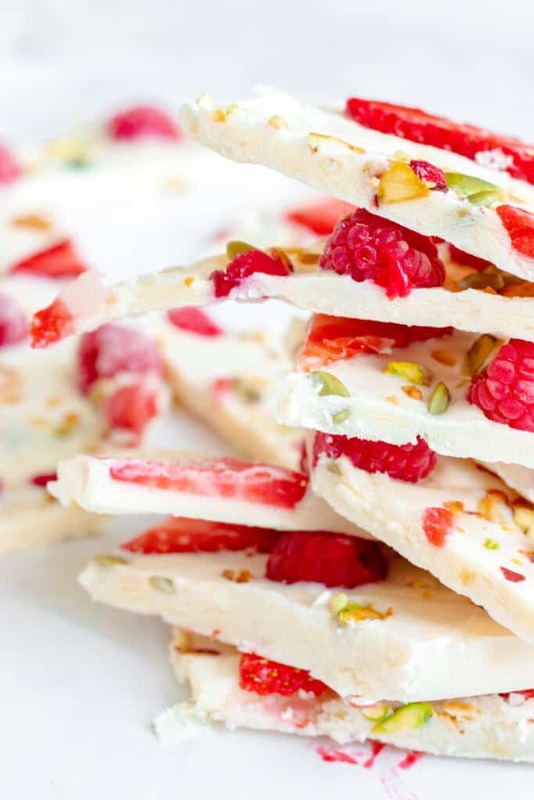 Tutti-frutti Bark: Flavour the plain yoghurt by whizzing it up with a few large handfuls of berries in a food processor. Top the yoghurt with a mixture of colourful tropical fruit and a sprinkle of toasted coconut chips. Kiwi, thinly sliced mango, blueberries, pineapple slices and watermelon all work well. Banoffee Bark: Top the vanilla yoghurt with thin slices of banana and slithers of chopped dates. 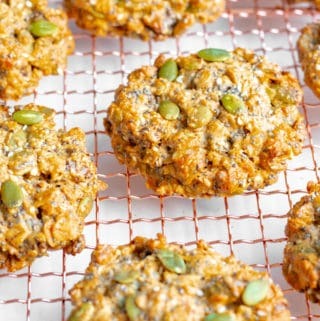 Generously sprinkle over a handful of granola for a nice crunch. Black Forest Bark: Flavour your yoghurt with ½ tsp natural almond extract and top with halves of fresh cherries, dark chocolate chips and crushed almonds for an indulgent yoghurt treat. As I type this, I have just finished the last piece of fruity yoghurt bark I had left in the freezer. I feel lost – what am I going to eat now!!! Seriously though, this is my new jam. It’s light, satisfying and the perfect snack. 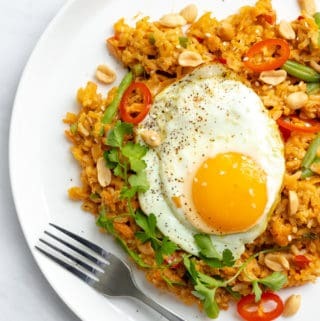 If you make this please let me know by sending me a picture to my IG @georgieeatsuk or leaving me a comment down below. Keep smiling! Creamy shards of frozen yoghurt topped with fresh fruity berries, chopped nuts and crunchy granola. The perfect refreshing snack or light dessert! Vegan, GF & healthy. Mix the yoghurt, vanilla extract and honey/maple syrup together in a large bowl until combined. Taste and add more sweetness if desired. 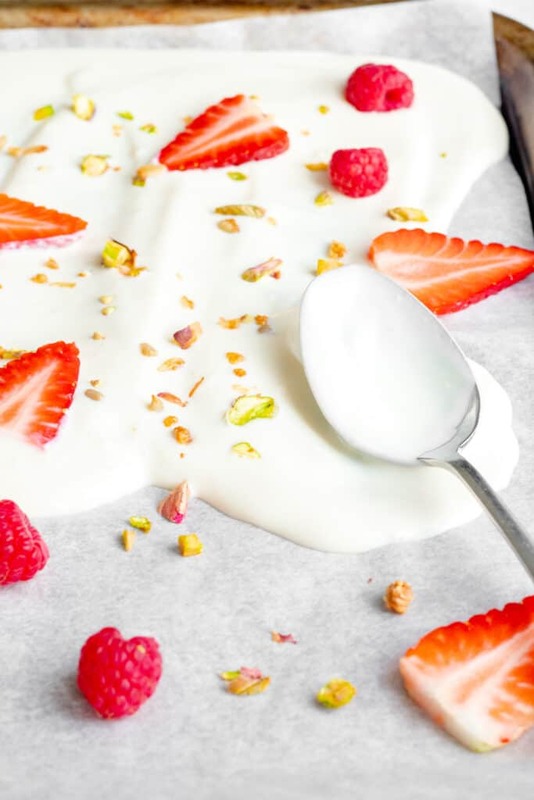 Pour the yoghurt onto a baking tray lined with baking parchment and spread it out into an even layer with a spatula. Top the yoghurt with the berries, then sprinkle over the nuts and granola. Put the tray into the freezer (making sure it is able to lay flat) for at least 3 hours, or until the yoghurt has frozen. Remove the tray from the freezer and break the yoghurt bark into shards. Transfer into an airtight container, using the parchment paper to separate the layers, and store in the freezer until ready to serve. 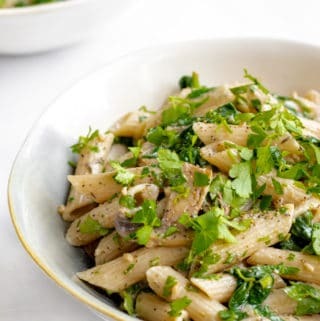 For variations on this recipe see within the post. This frozen yoghurt bark will keep well in the freezer for up to 3 months. I used coconut yoghurt to make my yoghurt bark but other dairy-free yoghurts (soya or almond etc. ), or full-fat dairy yoghurt also works well. I prefer to sweeten/flavour my own yoghurt but you could also use a pre-flavoured yoghurt if you wish. Make sure you are using vanilla extract and not essence. You could also use the same amount of vanilla paste or powder if you wish. 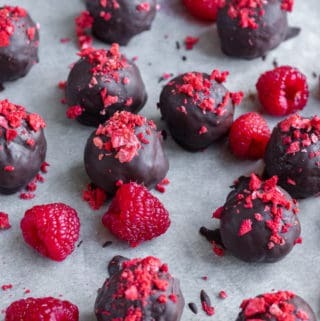 If you love quick snacks, you will love my Chocolate Date Truffle Recipe too!